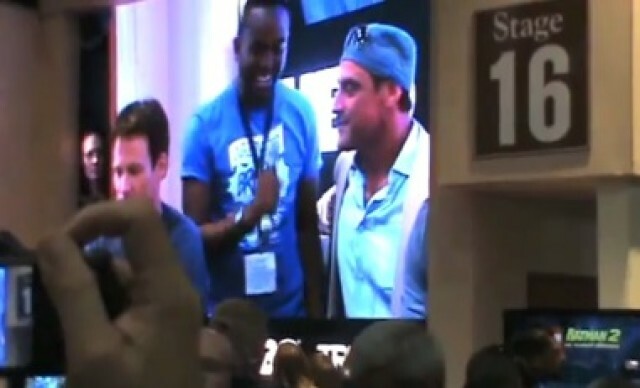 The following video was taken by me at the Warner Brother’s booth in the Exhibition Hall at 2012 Comic Con. The event took place right after the True Blood panel and I was among the crowds who were waiting for a glimpse at the cast members as they signed autographs for the lucky fans who had tickets. To be privileged to get an autograph and stand in the signing line, the fans had to be one of the first 100 to be in the autograph signing line early that morning and win a pass. Congratulations to the lucky truebies who got to meet the cast and get their True Blood posters signed. As you can see, it was quite crowded and it was hard to get too close, but I think this video provides a hint, for those not able to attend the event, of what it was like to be there among the crowds. i would give anything to get one of those signed posters. Thanks for providing, Lynn. Chaotic, but everyone (cast and fans alike) was certainly in a good mood. I saw more talking between cast members and the fans than actual signing. Lucky Truebies who were able to get their posters signed. This video is as close as I’ll get to the experience. Kudos to Alan and the cast for taking this time with the fans. I figure they represent those of us who will never make it to Comic Con. It’s a good thing I decided not to go to Comic-Con. I don’t think I would survive those crowds. It’s a zoo.